To increase NHS services in Welwyn Hatfield by fighting for acute and outpatient services to be more accessible for local residents. Over a number of years NHS services, previously based in Welwyn Hatfield, have been moved to the Lister Hospital or elsewhere. We believe it is unacceptable to see a continual drift of NHS services away from the fast‐growing population of Welwyn Hatfield. This trend has resulted in increased journey times, the potential for residents to be put‐off accessing medical assistance and greatly increased stress caused by limited transport options. But concern is not limited to the medical implications. The distancing of healthcare is also making it harder for friends and family to provide support, so important when a loved one is fragile and vulnerable in hospital. In short, we believe that the current location of many medical services is detrimental to the health of Welwyn Hatfield constituents and that it needs to change. Learn all about the Make Healthcare Local campaign. Our goals, how the campaign is structured and more. We need your support to argue the case for bringing healthcare services back to Welwyn Hatfield. Sign the petition here. 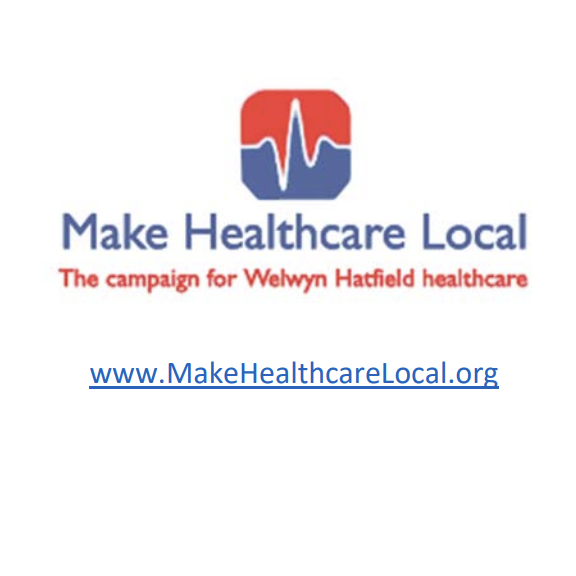 Part of our campaign includes collecting healthcare testimonials from Welwyn Hatfield residents so we can build a picture of what’s really happening locally.